The best USAA credit cards offer US military servicemembers, veterans, and their families cashback on everyday purchases. Cashback credit cards are a great way to be rewarded for spending when you don't have travel plans. If you do like to travel, check out my best credit card bonuses. I've used these cards to stay at great hotels for free and travel international business class for free. USAA has been my bank of choice for over 10 years. I have many checking and savings accounts with them. I also have my renters and auto insurance with USAA. Their mobile app is the best mobile banking app I have used. Two of the best features of USAA credit cards are no annual fees and no foreign transaction fees. If you are stationed overseas or frequently travel for work, these are essential benefits for you. 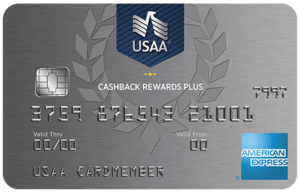 The USAA Cashback Rewards Plus AMEX card offers good cashback category bonuses. You can earn 5% cashback on the first $3000 you spend on gas and military base purchases. This includes on and off base gas stations. MIlitary base purchases include: AAFES, NEX, BX, PX, Shoppette, and other exchange locations as well as DECA Commissaries. That's up to $150 (5% of $3000) annual cashback in your pocket for commuting expenses and shopping on base. After $3000 in purchases the cashback goes down to 1% for the remainder of the calendar year. This AMEX card also offers 2% cashback on the first $3000 spent annually on supermarket purchases. This would kick in after the 5% cashback on on base purchases. This way you're always getting at least 2% cashback at the Commissary. You earn 1% on all other purchases. Simple 1.5% cashback on all purchases. No categories to track or quarterly sign ups. 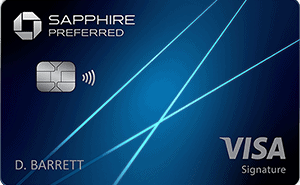 The USAA Preferred Cash Rewards Visa card offers a simple 1.5% cashback on all purchases. 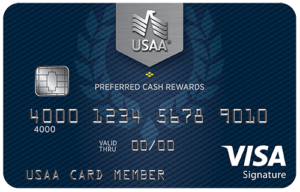 This is a great backup card to the USAA Cashback Rewards Plus card listed above, since that card defaults to 1% on all purchases outside of the bonus categories. Receiving 1.5% cashback adds up quick, as it is 50% higher than 1% cashback on all purchases. Check out my other page if you are interested in other cashback credit cards with no annual fee for military servicemembers. You can earn up to 6% cashback at US grocery stores, including OCONUS Commarisaries, without paying the normal $95 annual fee. You can also earn 4% cashback on dining and a $500 welcome bonus on some cards. If you're interested in travel cards, check out the amazing cards Chase and American Express waive the annual fee on for military. I keep this page updated monthly on the best credit card deals currently available for military servicemembers. 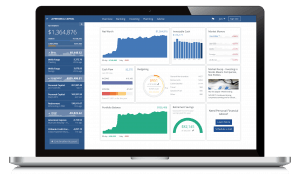 I recommend many of USAA's products. Their customer service is industry leading and I usually have a great customer service experience when I need to reach out to them. It's a sign of their excellent online banking that I have not had to walk into a physical bank in the past decade. Start getting some cashback for your everyday purchases today with a USAA cashback credit card.